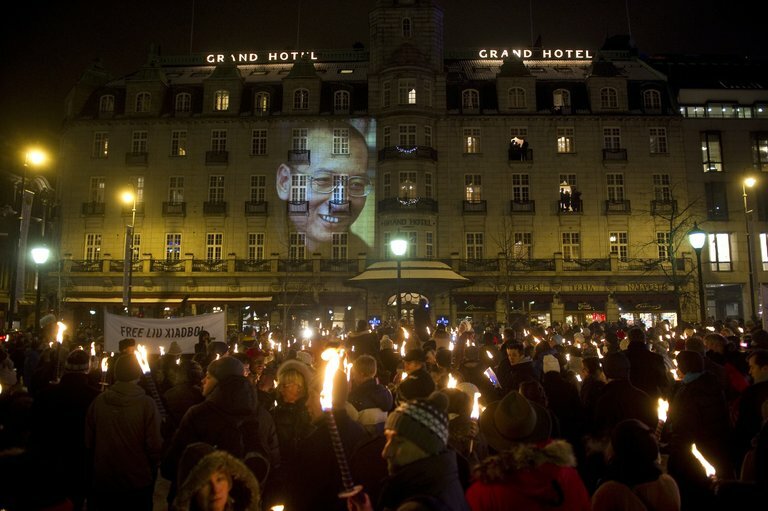 A parade in honor of Liu Xiaobo, a Chinese intellectual awarded the Nobel Peace Prize while in jail, in Oslo in 2010. Mr. Liu was represented at the Nobel ceremony by an empty chair. HONG KONG — The Chinese government tried to silence Liu Xiaobo by banning the publication of his writing, barring him from public speaking and locking him behind bars. But much of his work has been published overseas. It reveals Mr. Liu as a staunch advocate of democratic change in China who could be harshly critical of the country’s political authorities, some of its more celebrated writers and even, at times, himself. We advocate the spread of democracy in China through peaceful means, and we oppose violence in any form. At the same time, we are unafraid of violence. Our aim is to show through peaceful means how the iron resolve of Chinese people who want democracy will in the end demolish an undemocratic order that maintains itself with bayonets and lies. China, as a major nation of the world, as one of five permanent members of the United Nations Security Council, and as a member of the U.N. Council on Human Rights, should be contributing to peace for humankind and progress toward human rights. Unfortunately, we stand today as the only country among the major nations that remains mired in authoritarian politics. Our political system continues to produce human rights disasters and social crises, thereby not only constricting China’s own development but also limiting the progress of all of human civilization. This must change, truly it must. The democratization of Chinese politics can be put off no longer. During his trial, Mr. Liu defended Charter 08, saying it accurately described events such as the Anti-Rightist Campaign of the late 1950s, the Great Leap Forward of 1958-61, the Cultural Revolution and the Tiananmen crackdown of June 3-4, 1989. Third, in the past two decades, from 1989 to 2009, I have always expressed the view that China’s political reforms should be gradual, peaceful, orderly, and controlled. I have also consistently opposed quick one-leap radical reforms, and even more so violent revolution. That bloody dawn in 1989 … showed me how shallow and self-centered I still was, taught me to recognize the warmth and the inner strength of love, and gave me new appreciation of what is most important in life. I knew from that time on I would forever be living with the guilt of a survivor and in awe of the souls of the dead. My tendency to idealize Western civilization arises from my nationalistic desire to use the West in order to reform China. But this has led me to overlook the flaws in Western culture — or, even if I see them, to set them aside intentionally. I have not, therefore, been able to stand apart from Western culture, take a critical view of it and perhaps get a better view of human frailty more generally. I have been obsequious toward Western civilization, exaggerating its merits, and at the same time exaggerating my own merits. I have viewed the West as if it were not only the salvation of China but also the natural and ultimate destination of all humanity. I look forward to [the day] when my country is a land with freedom of expression, where the speech of every citizen will be treated equally well; where different values, ideas, beliefs and political views … can both compete with each other and peacefully coexist; where both majority and minority views will be equally guaranteed, and where the political views that differ from those currently in power, in particular, will be fully respected and protected; where all political views will spread out under the sun for people to choose from, where every citizen can state political views without fear, and where no one can under any circumstances suffer political persecution for voicing divergent political views. I hope that I will be the last victim of China’s endless literary inquisitions and that from now on no one will be incriminated because of speech.